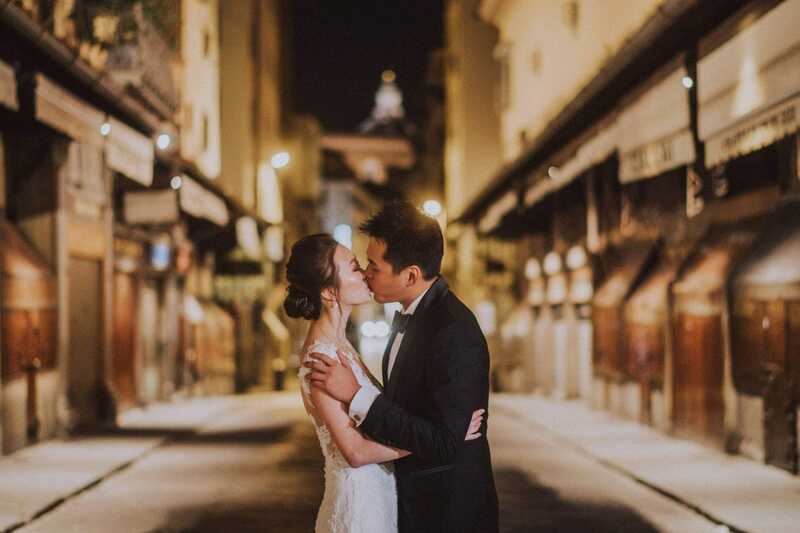 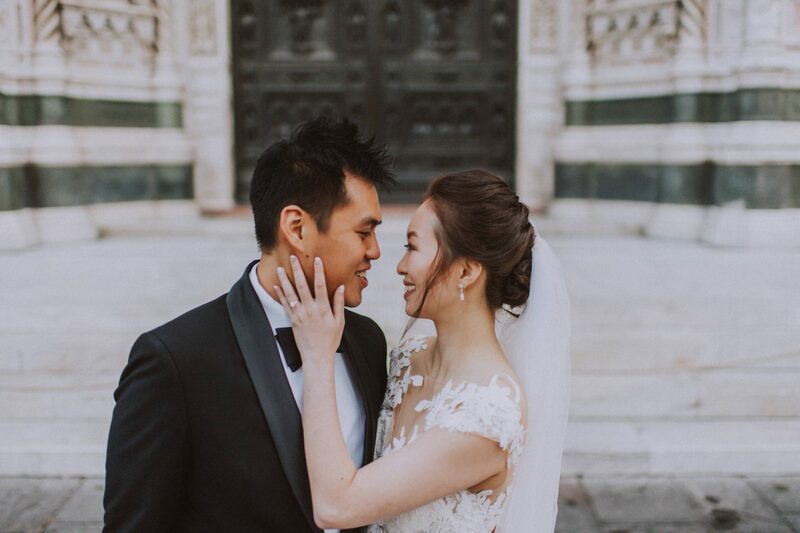 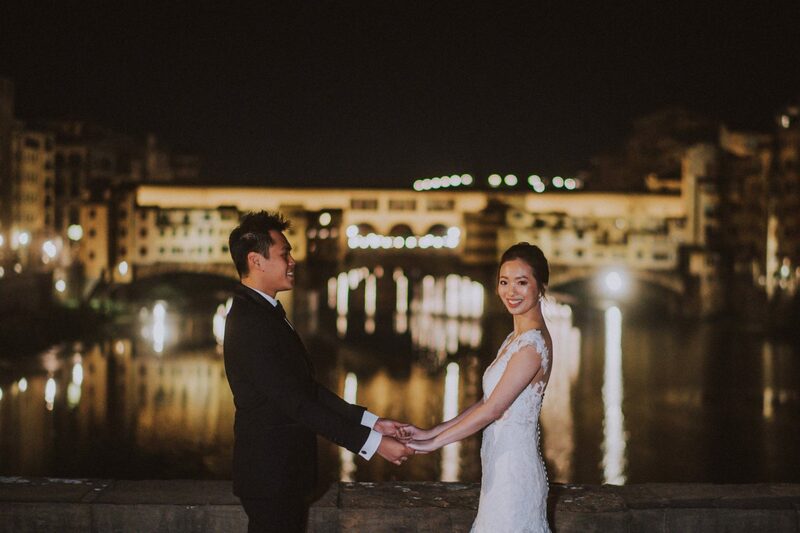 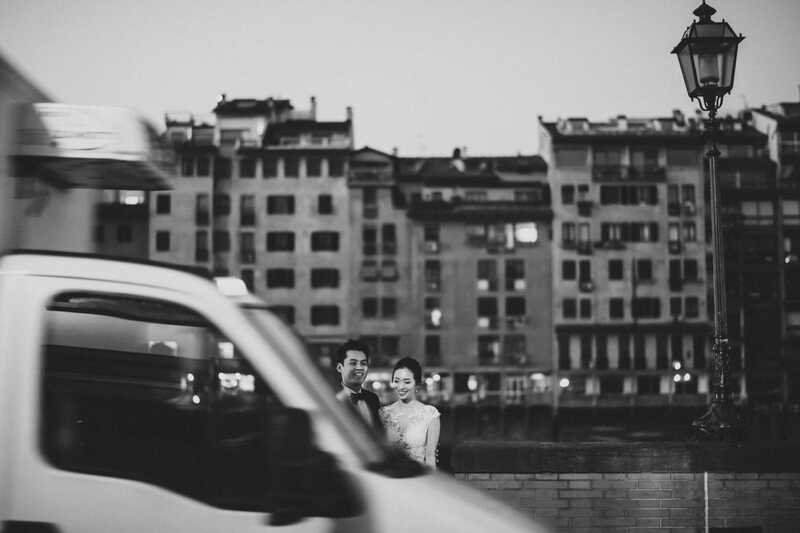 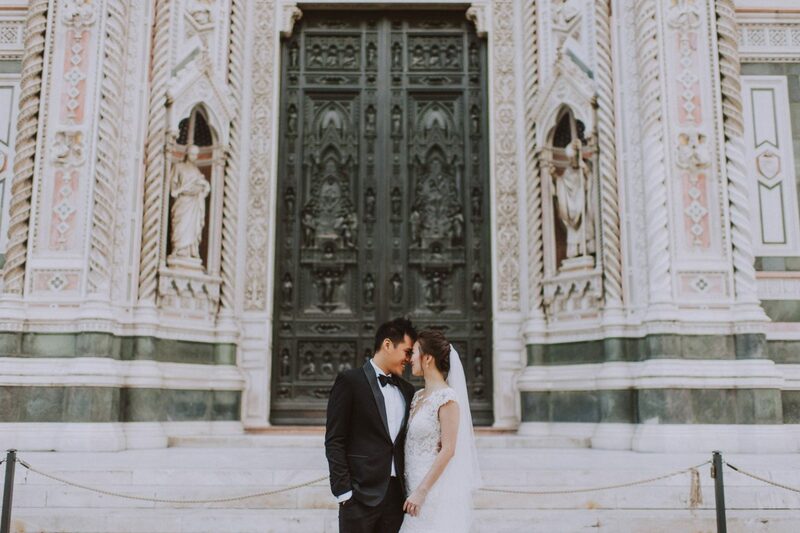 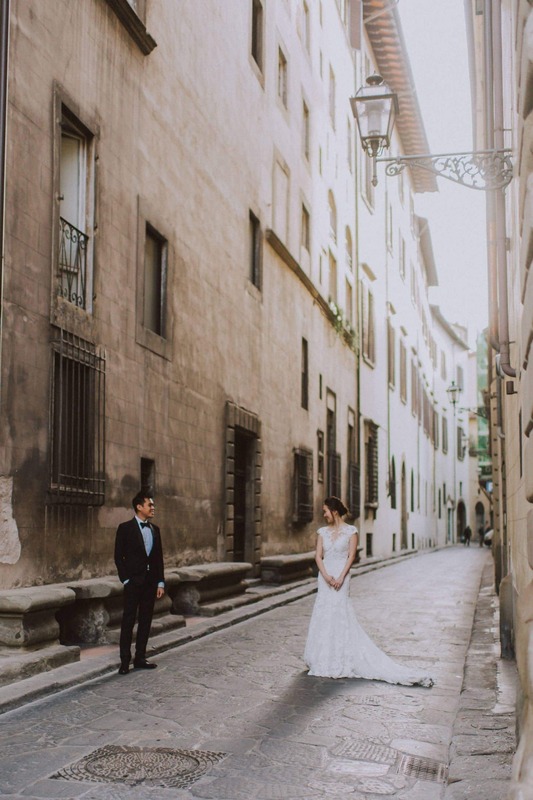 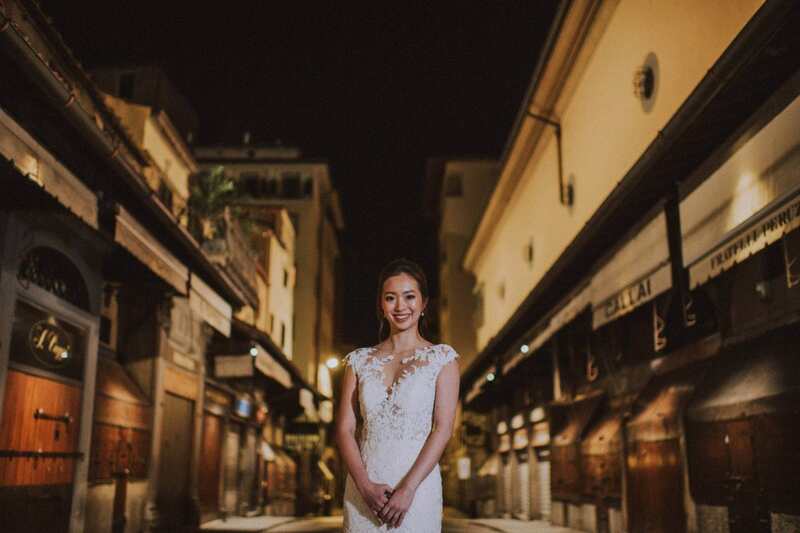 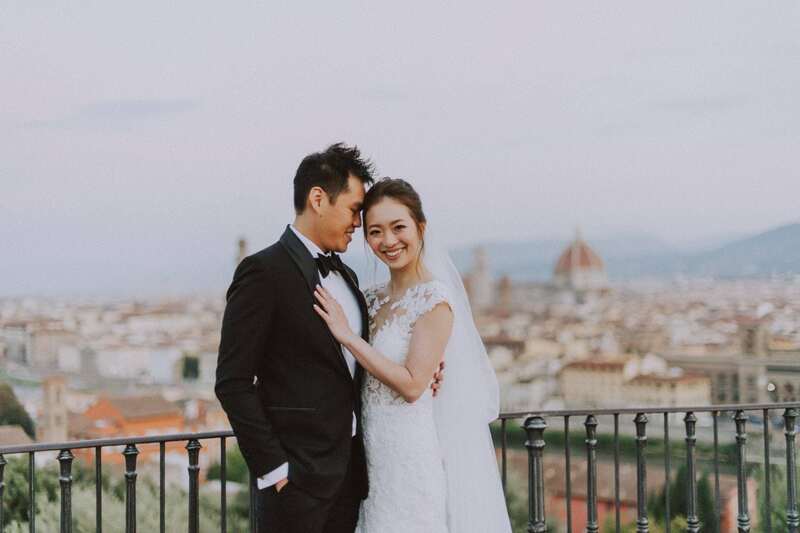 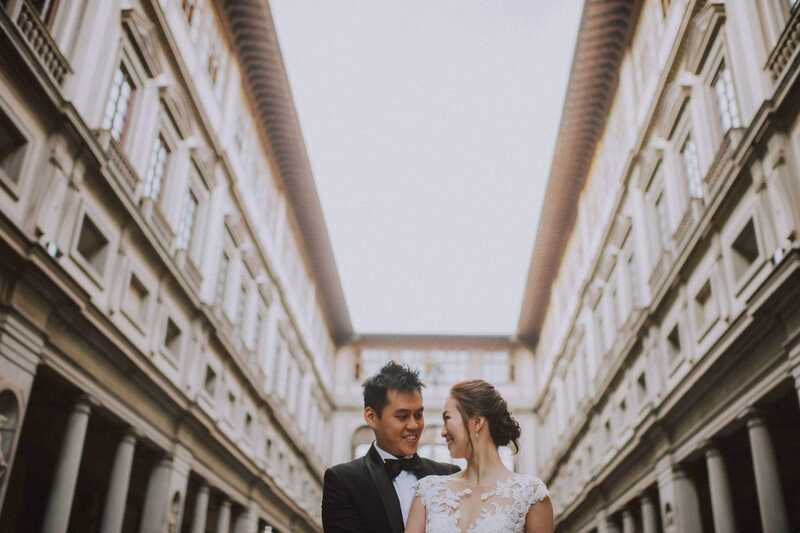 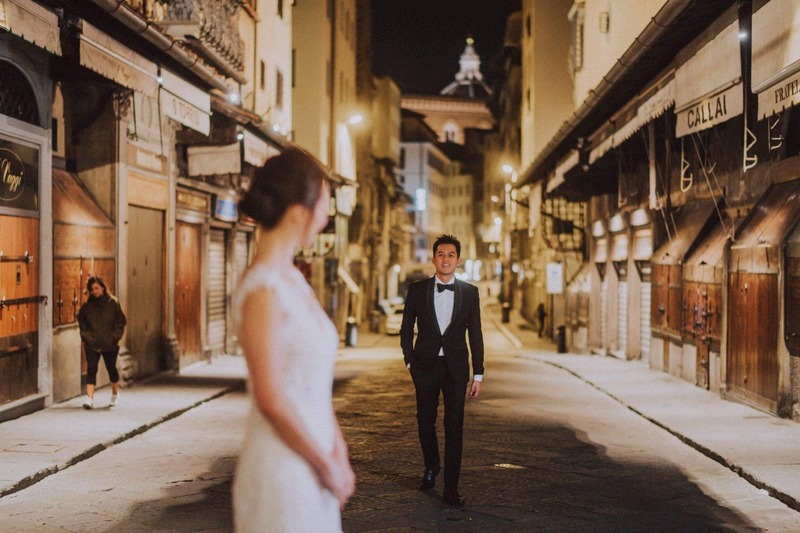 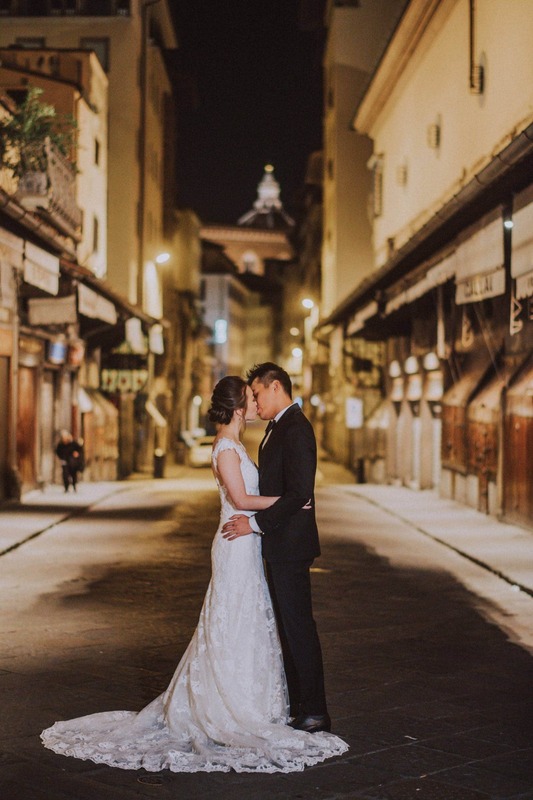 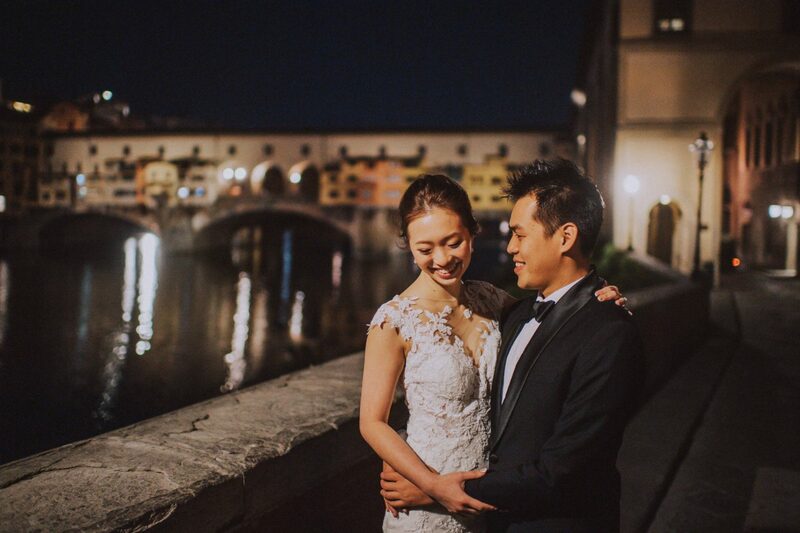 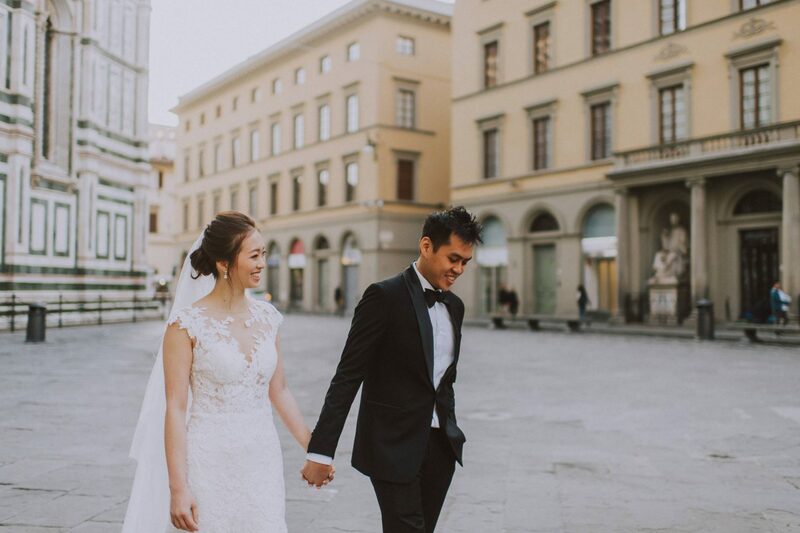 These two lovebirds from Hong Kong chose Italy as their honeymoon destination. 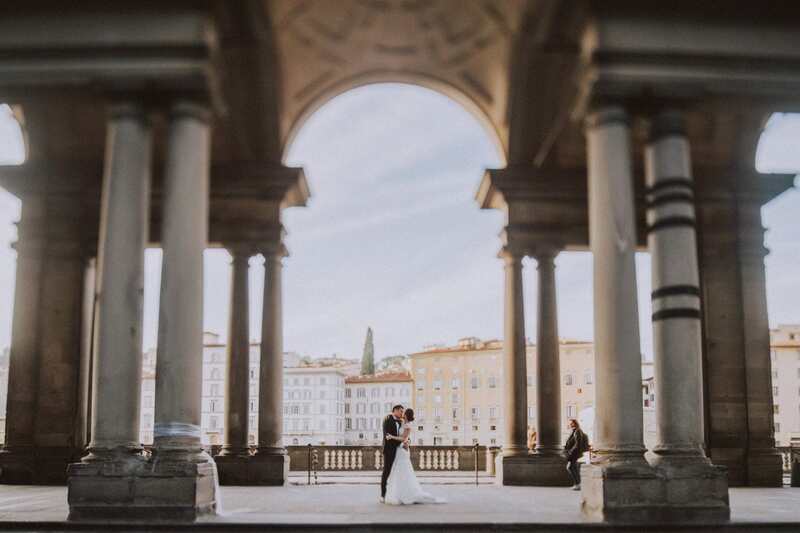 They couldn’t go anywhere more romantic When Bronson contacted me he was looking for a photographer in Florence and Venice who could take some romantic photos during their honeymoon trip. 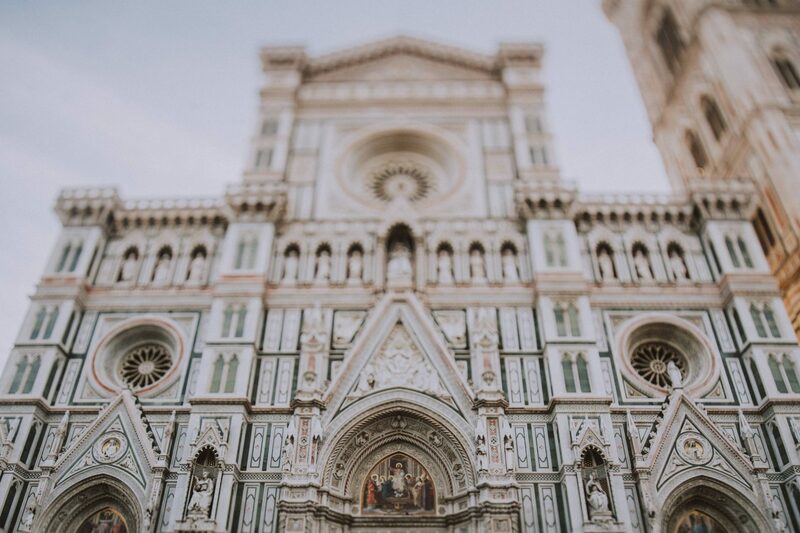 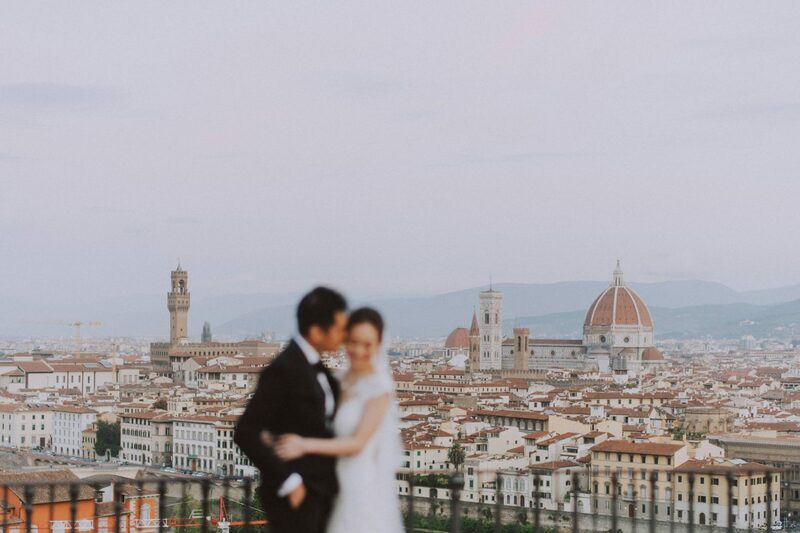 Before falling in love in Venice, Florence has always been my favorite city in Tuscany. 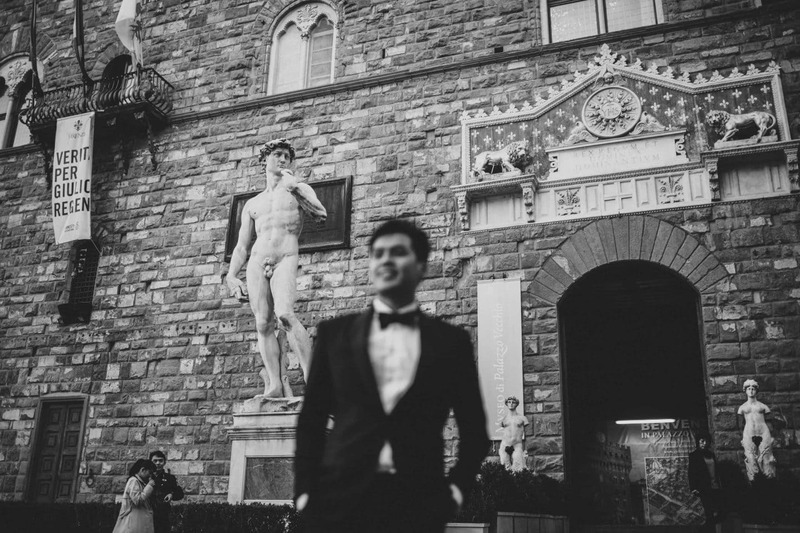 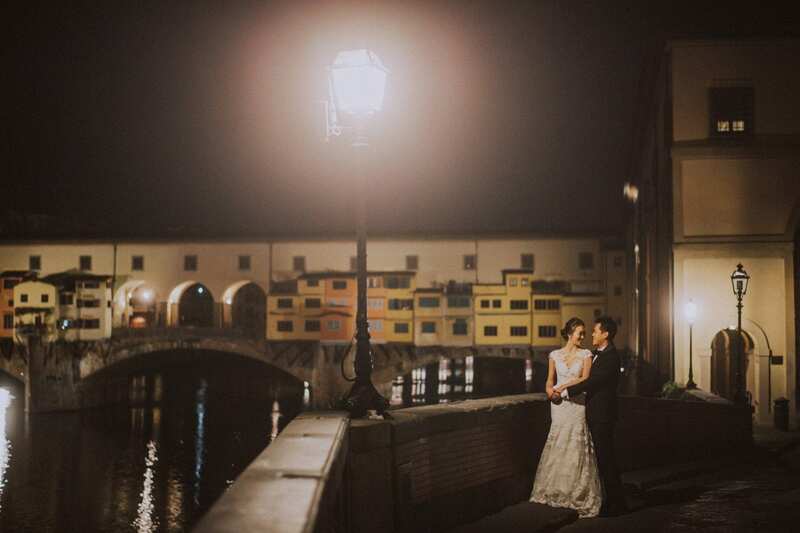 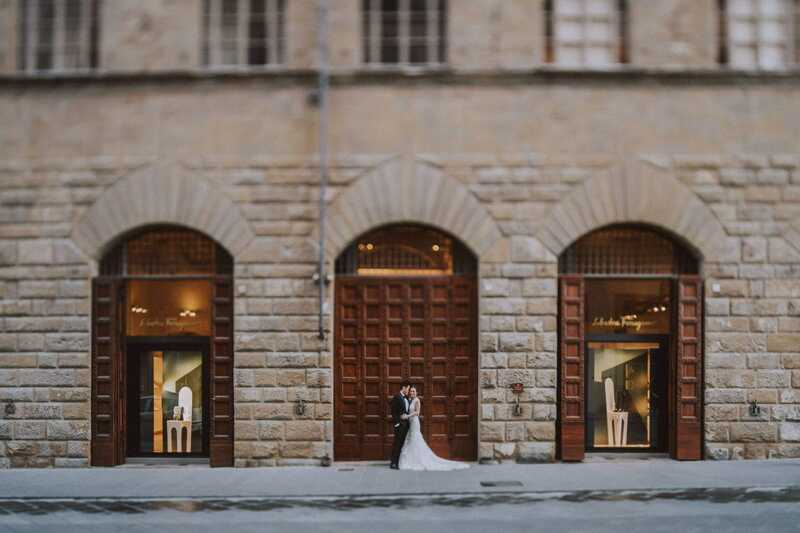 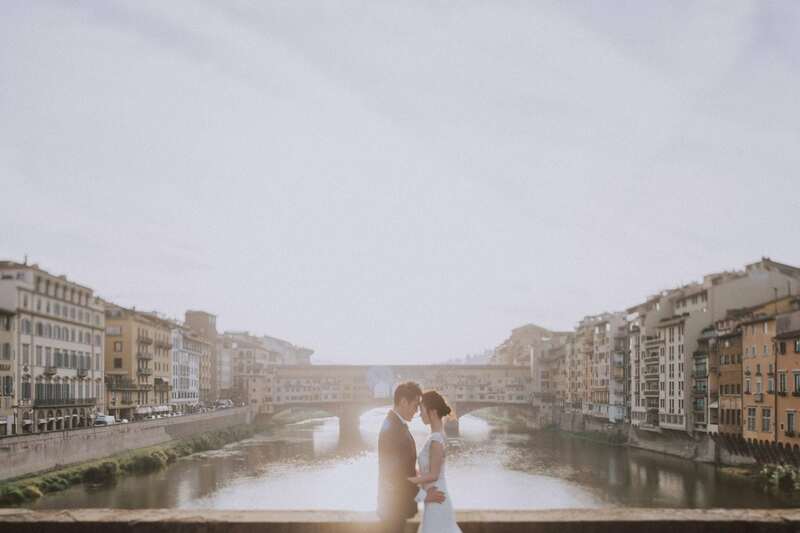 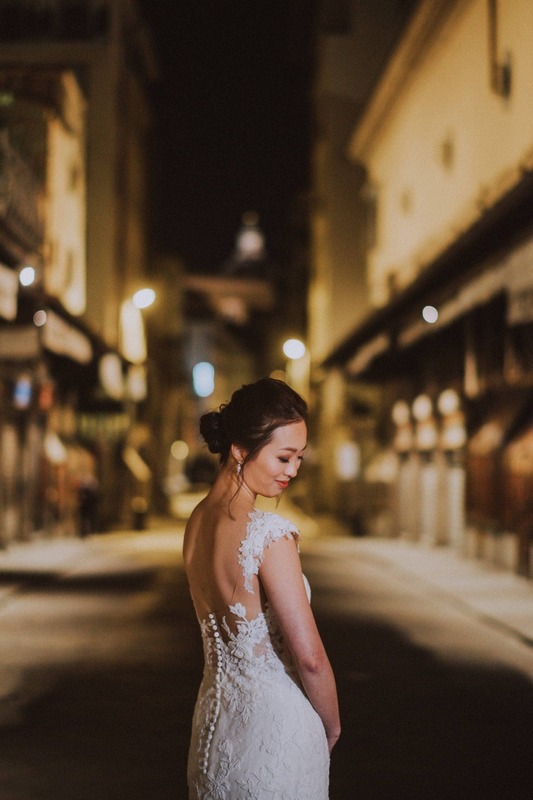 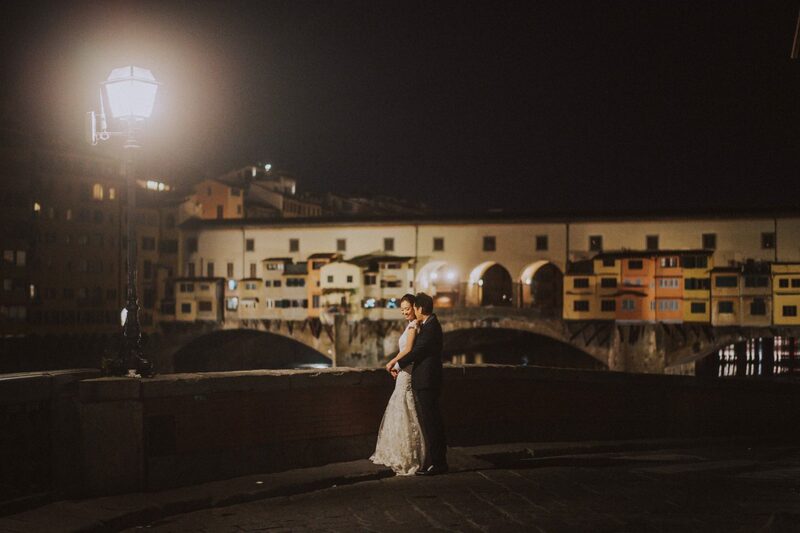 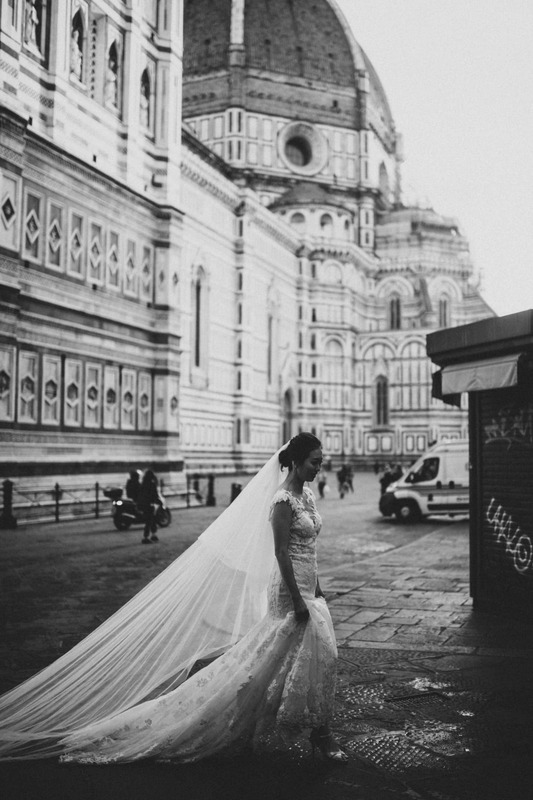 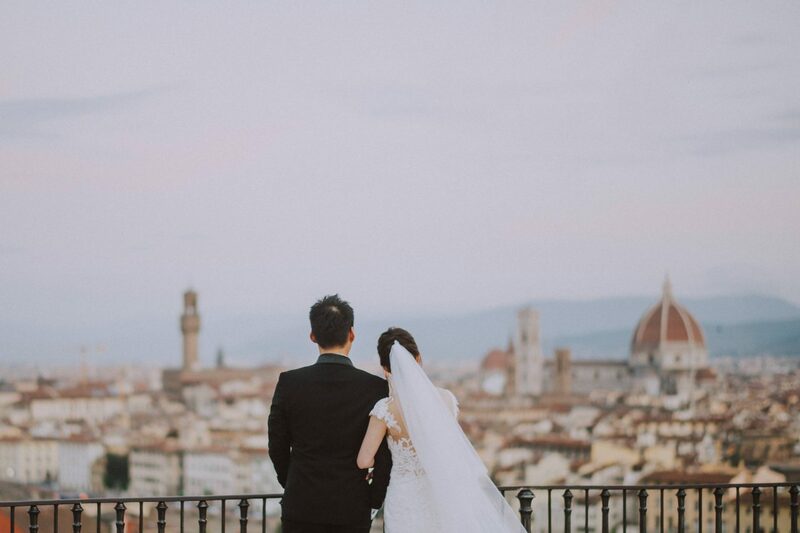 After Venice, taking wedding, honeymoon or engagement photos in Florence become my second passion. 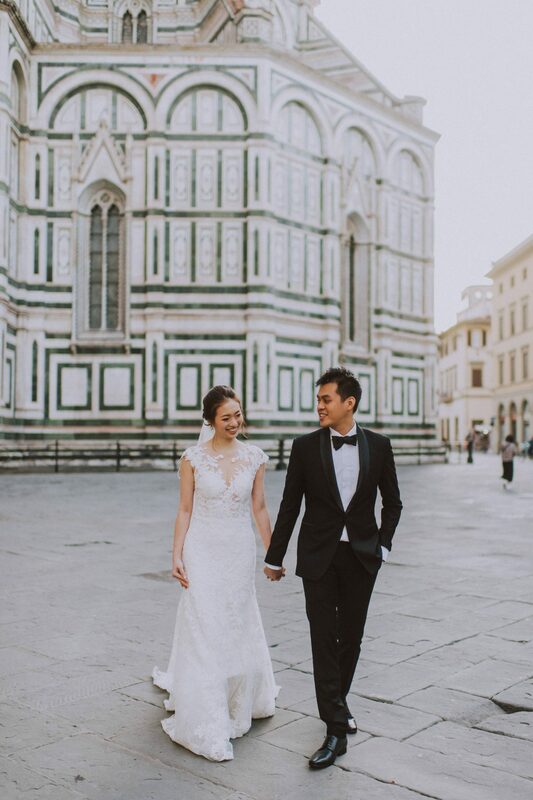 Sometimes I’d like to be Asian or American just to celebrate my wedding or spending my honeymoon in Italy! 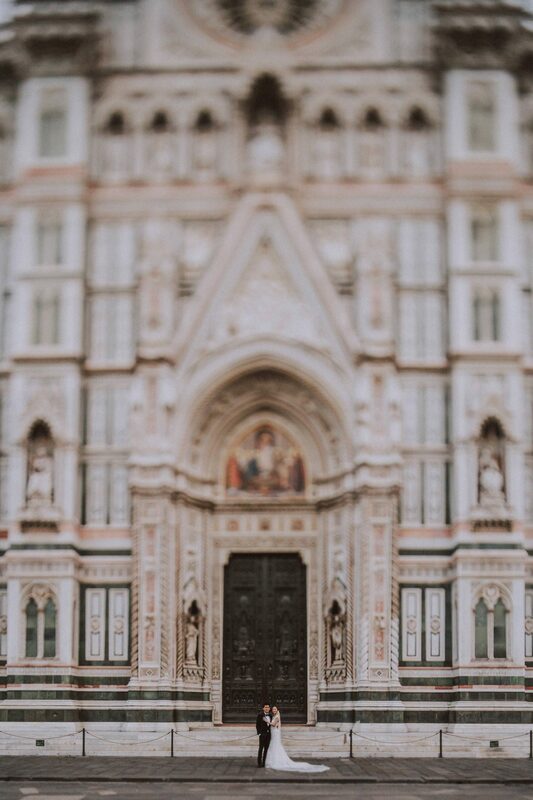 Its beauty with so much art is absolutely fascinating! 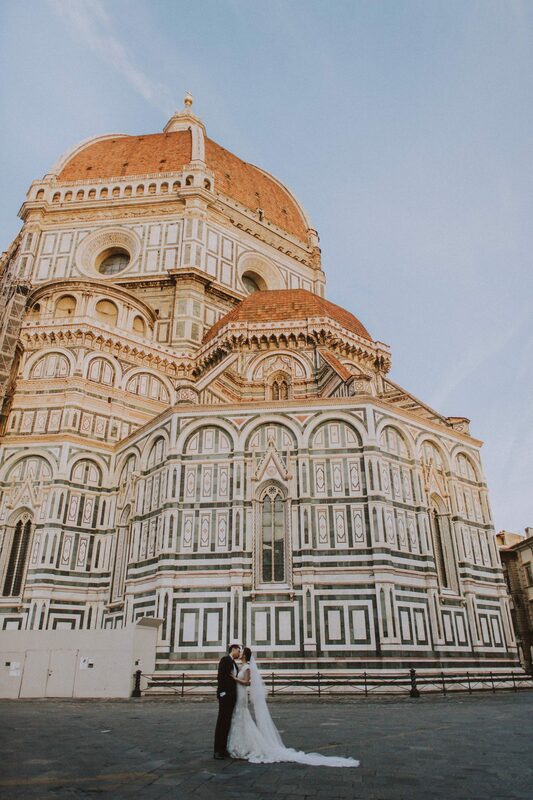 Italy, thanks to the excellent climate and relaxed lifestyle is the perfect destination for every honeymooner. 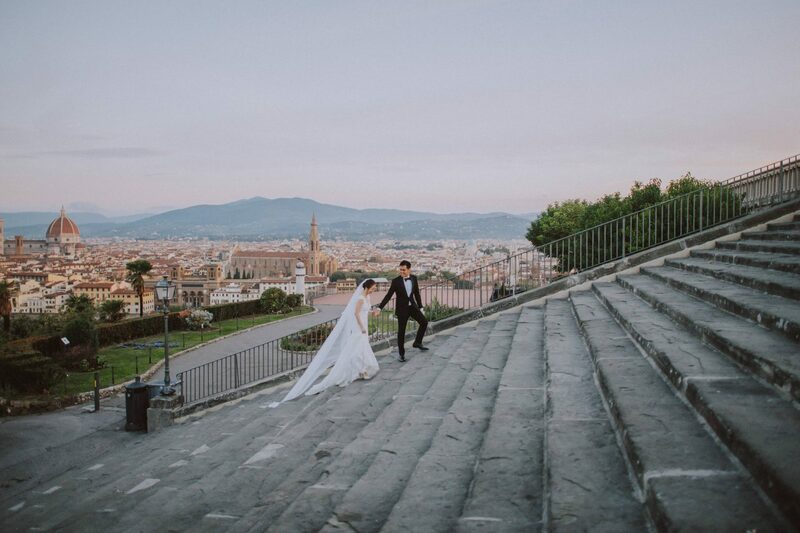 From this point of view, my clients are so lucky. 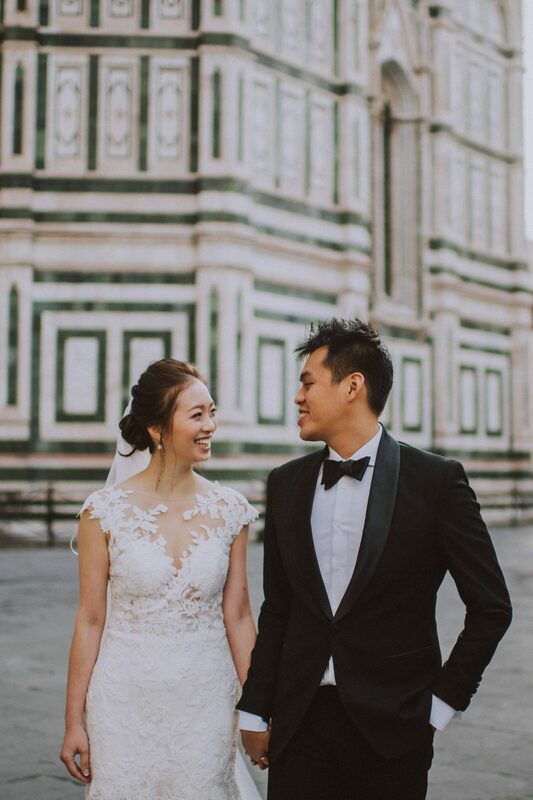 When it comes to having a couple of Asians in front of the camera, it’s always so much fun for me The way a couple interacts while being photographed it’s a bit difficult for us (in terms of European culture) to understand. 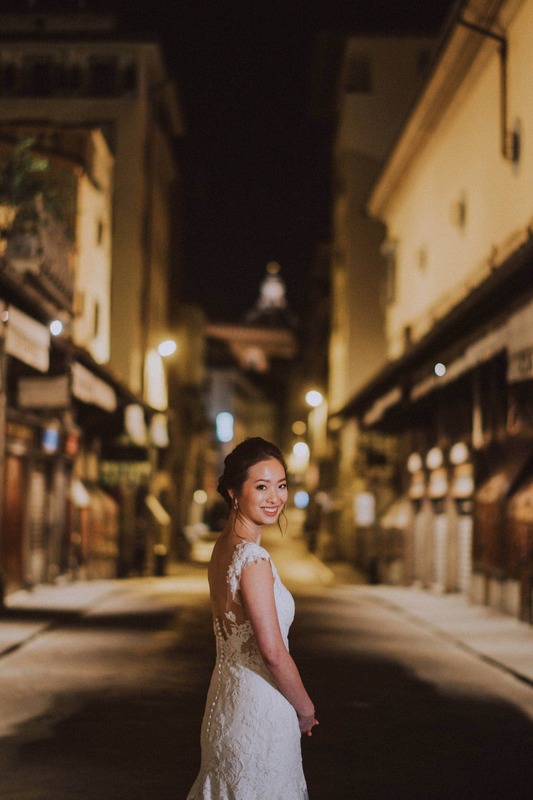 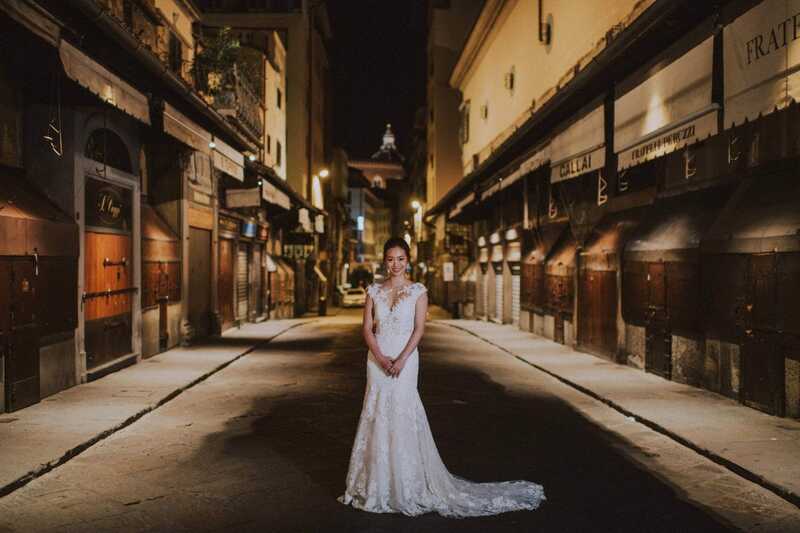 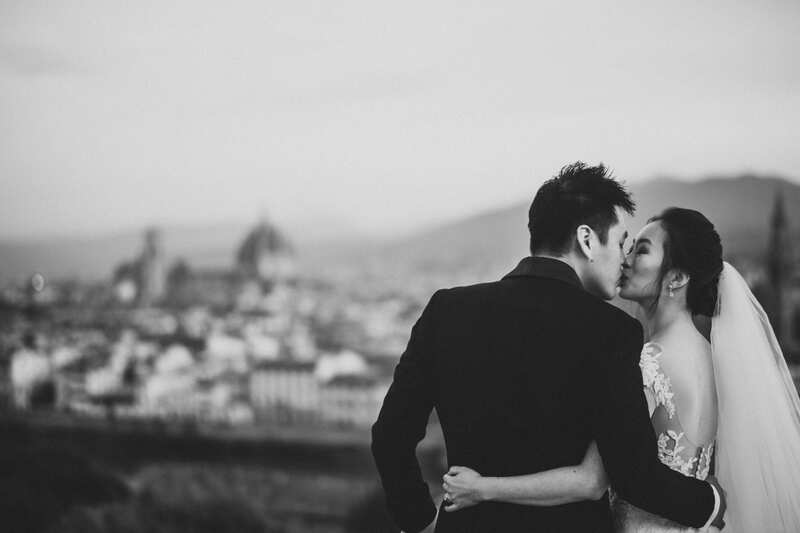 Asian’s very private and different way to show their love to each other is pretty challenging for European photographers because of the classical photographic approach they are normally accustomed to. 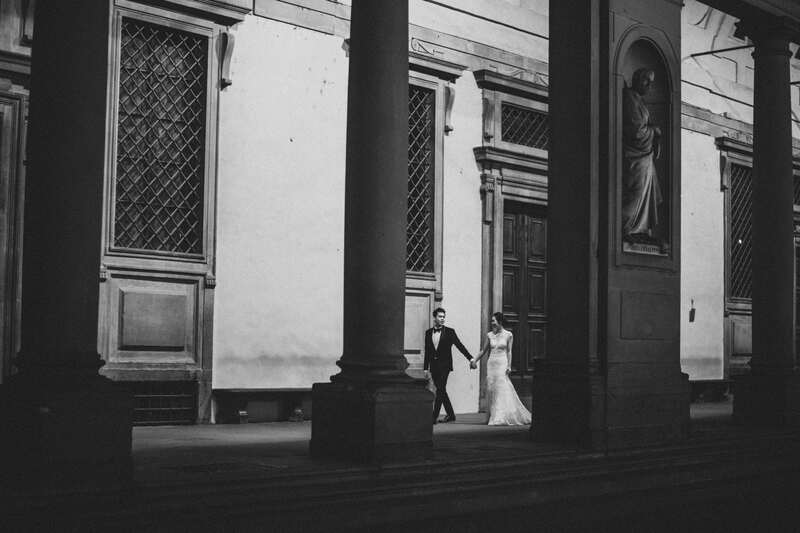 In public they’re so discrete so I had to start thinking differently. 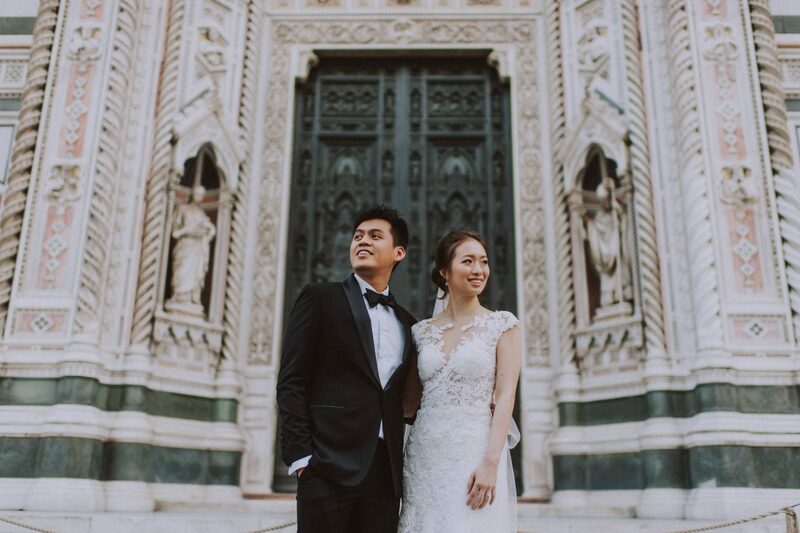 Fortunately we quickly found our way to communicate getting a nice feeling and enjoying our time together both in Venice and Florence. 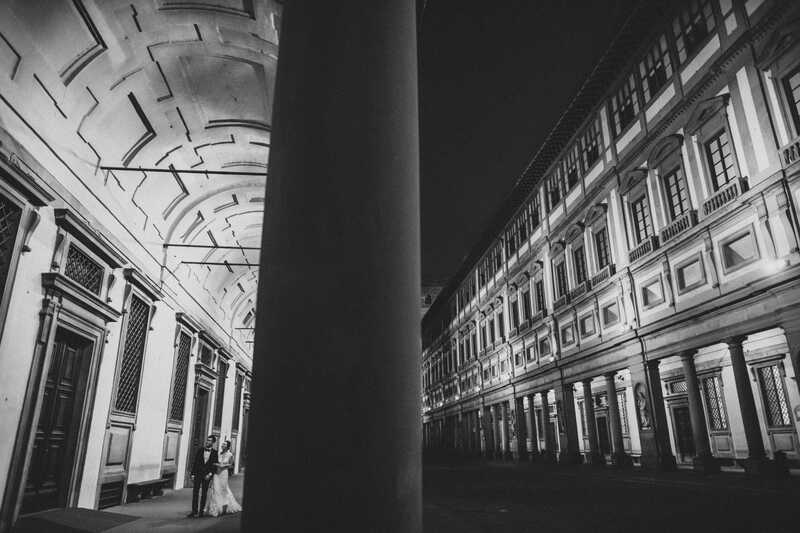 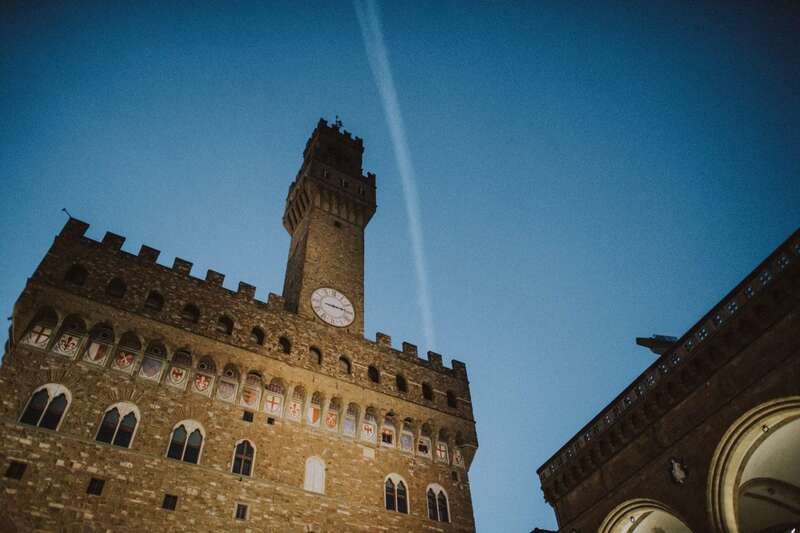 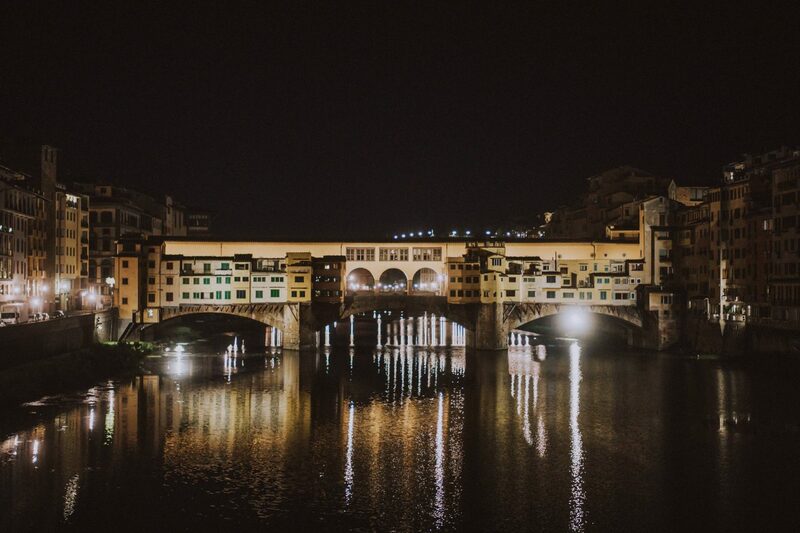 Have you ever thought about taking some photos in Florence also by night? 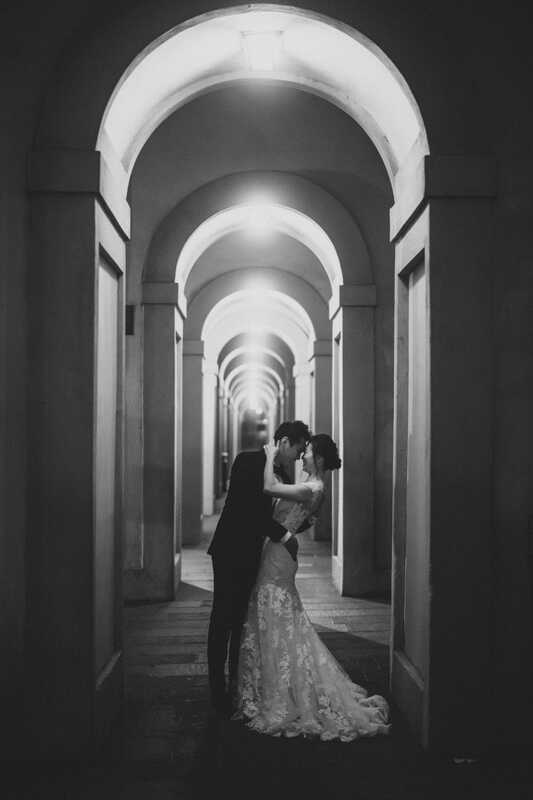 In reference to this topic feel free to have a look at this blog about why considering to have a photo shoot in Venice by night.Well, we did it not only in Venice but also in Florence in order to get some dramatic photos to be added to their gallery.Even though it was a honeymoon shooting, they brought their wedding dresses all the way from Hong Kong in order to get even more dreamy photos. 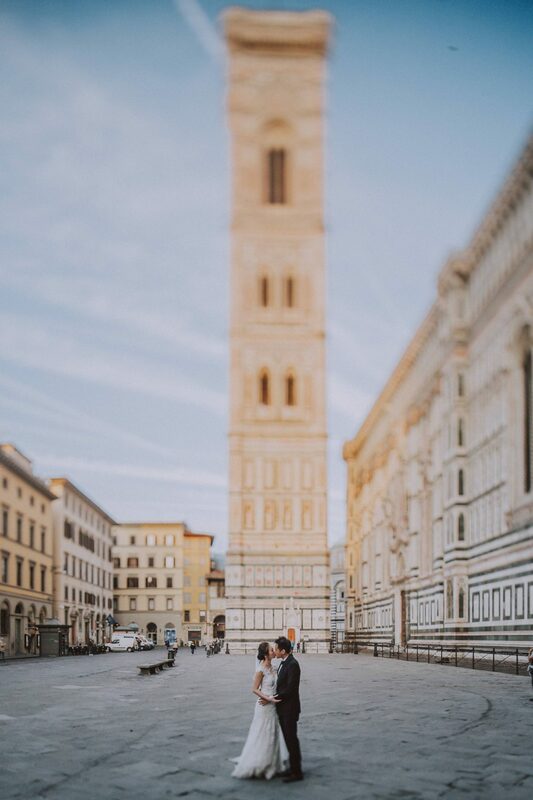 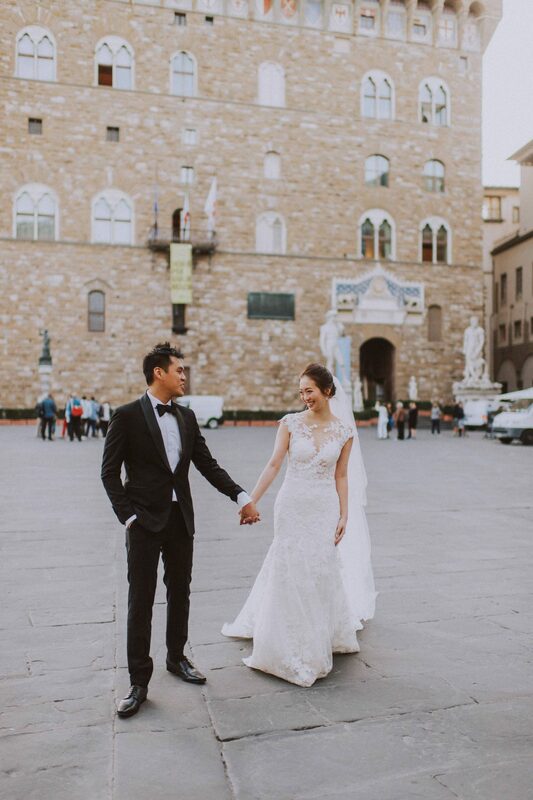 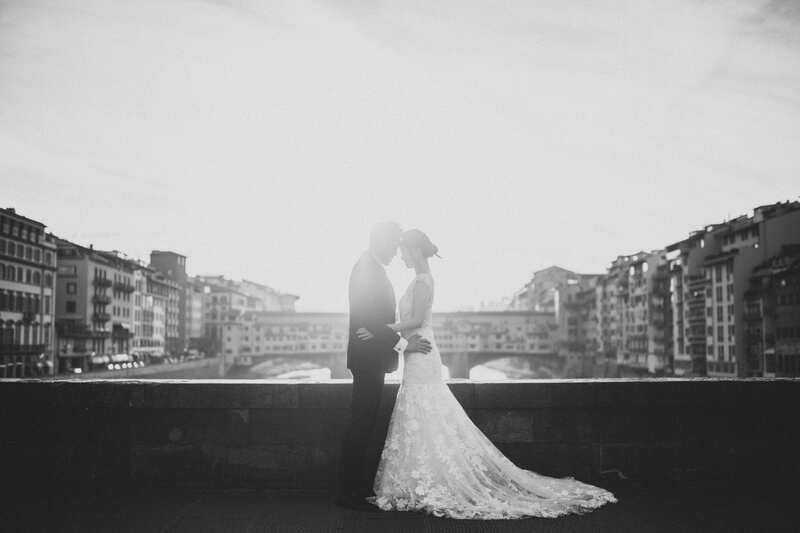 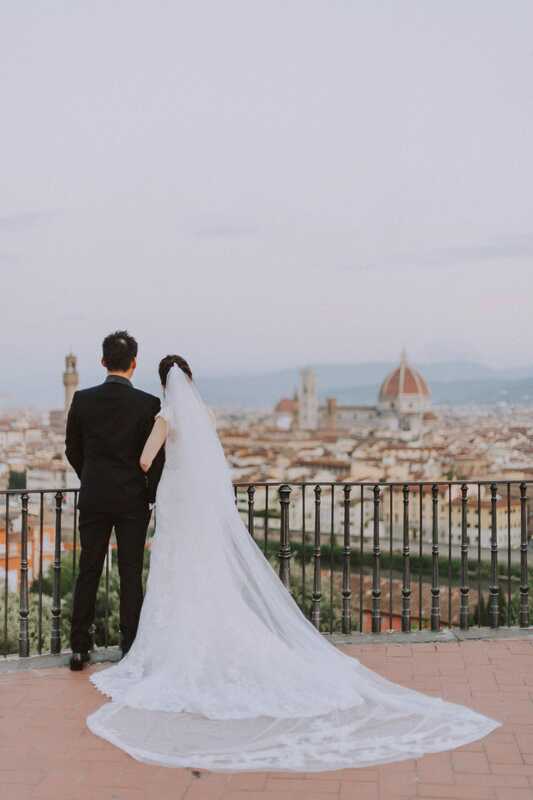 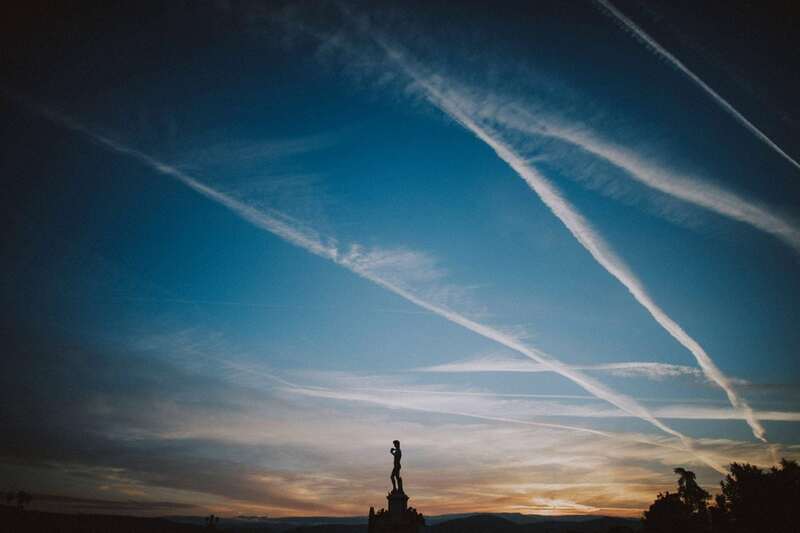 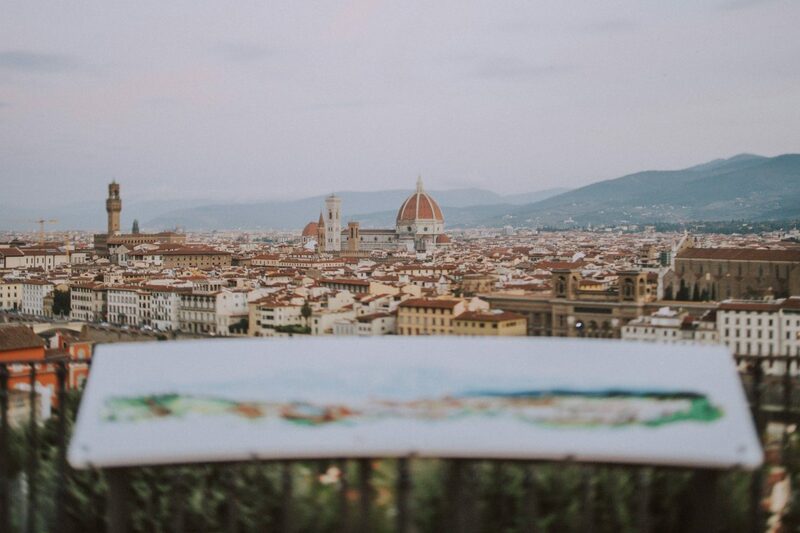 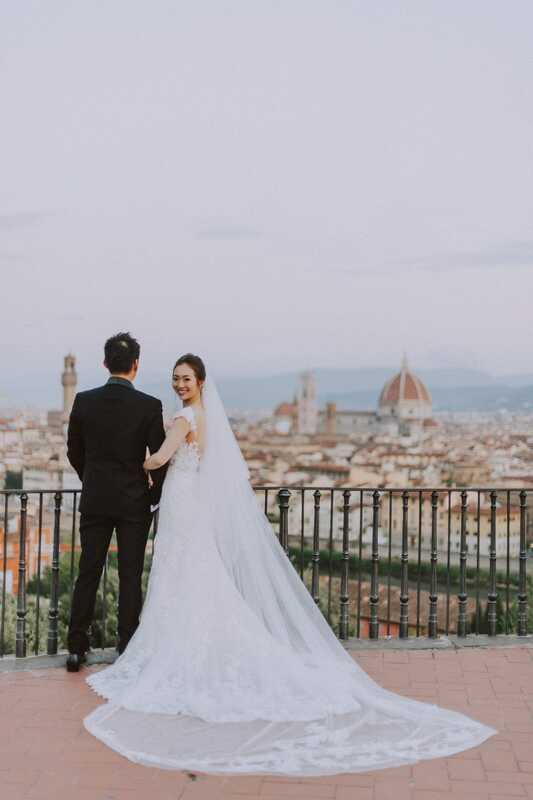 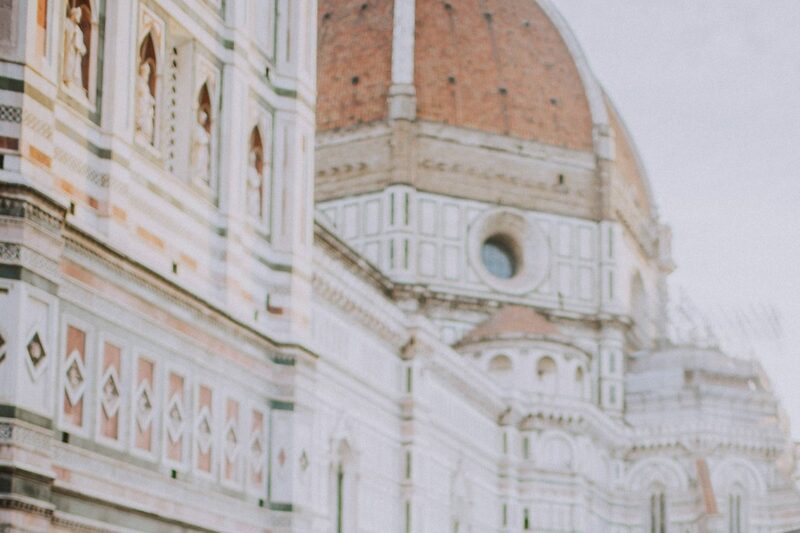 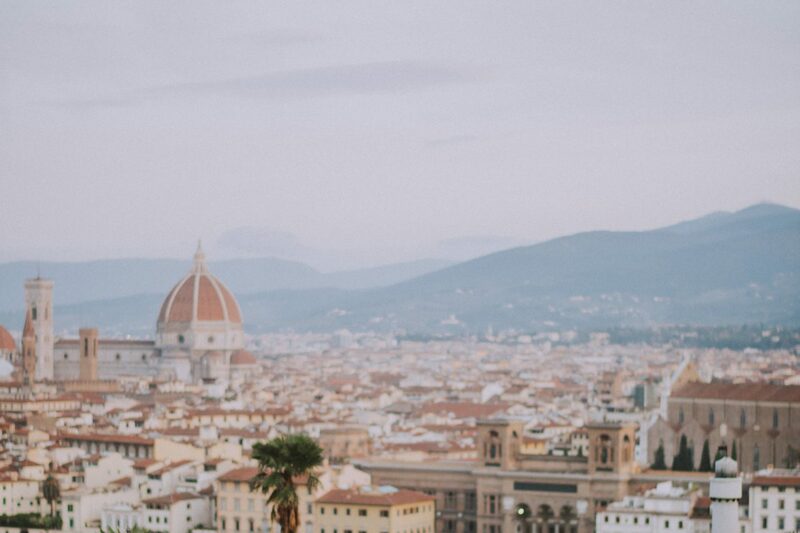 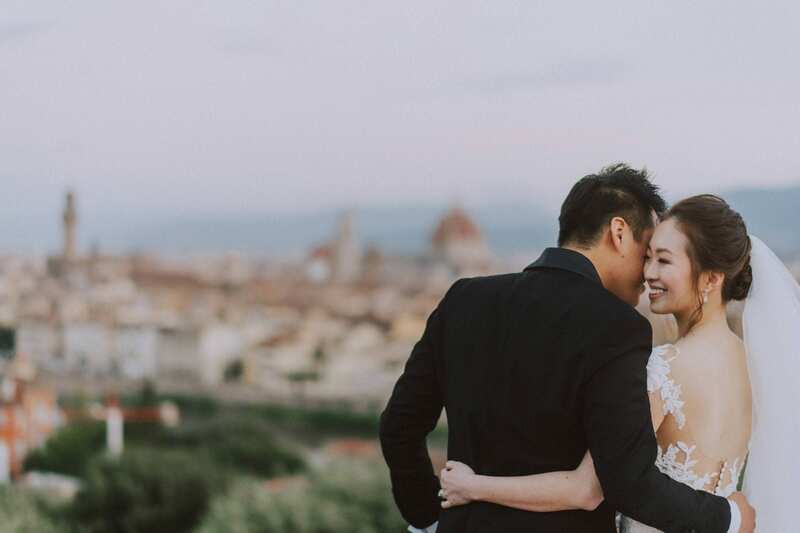 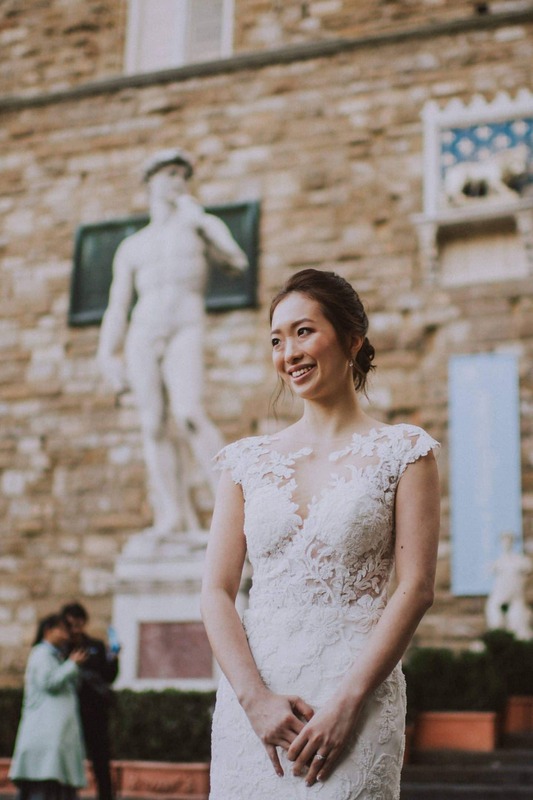 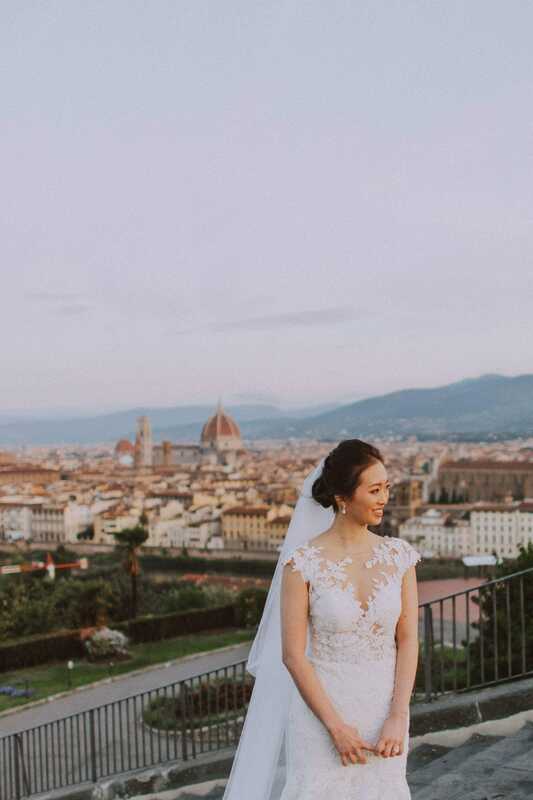 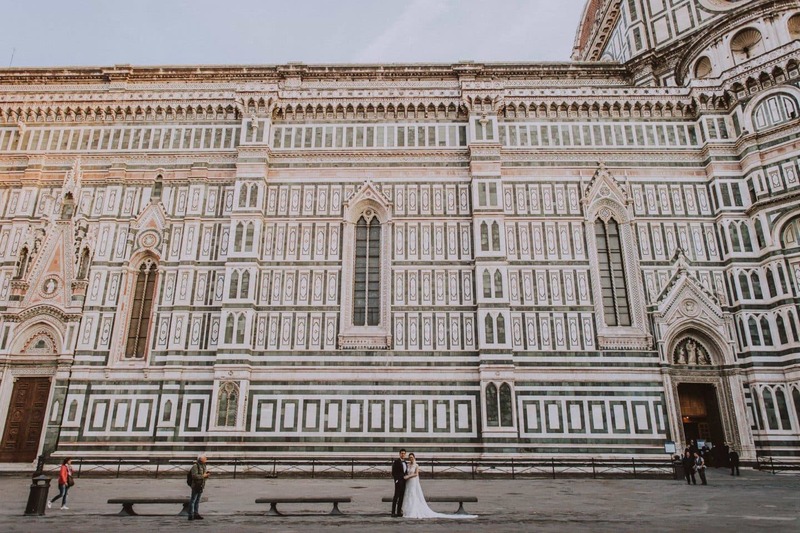 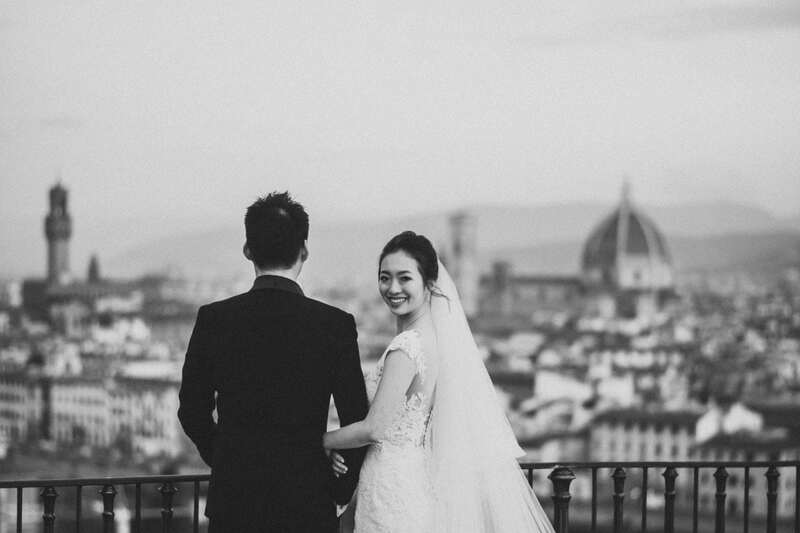 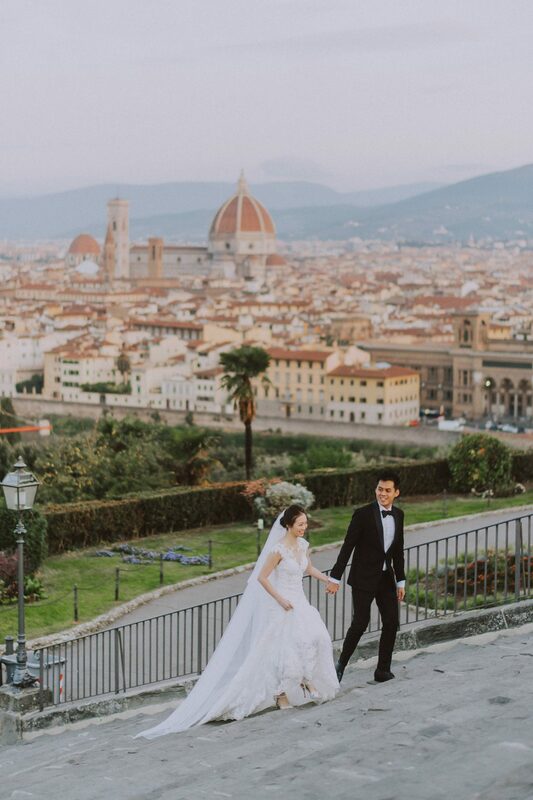 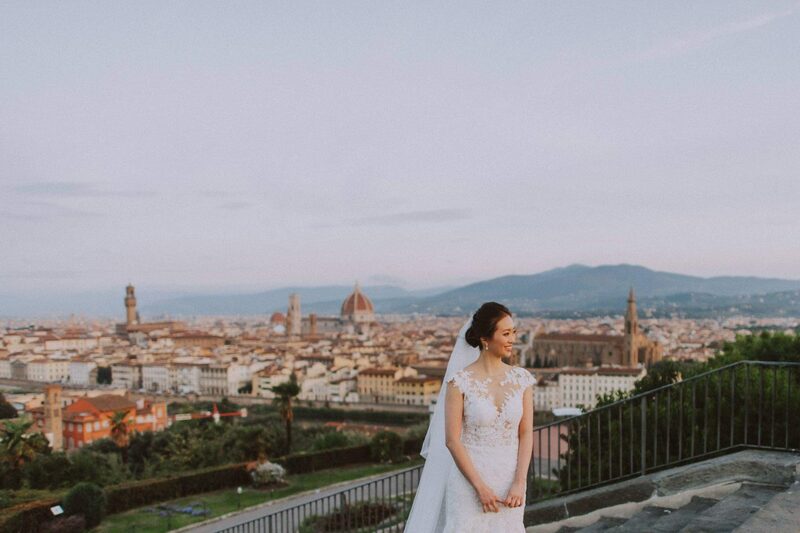 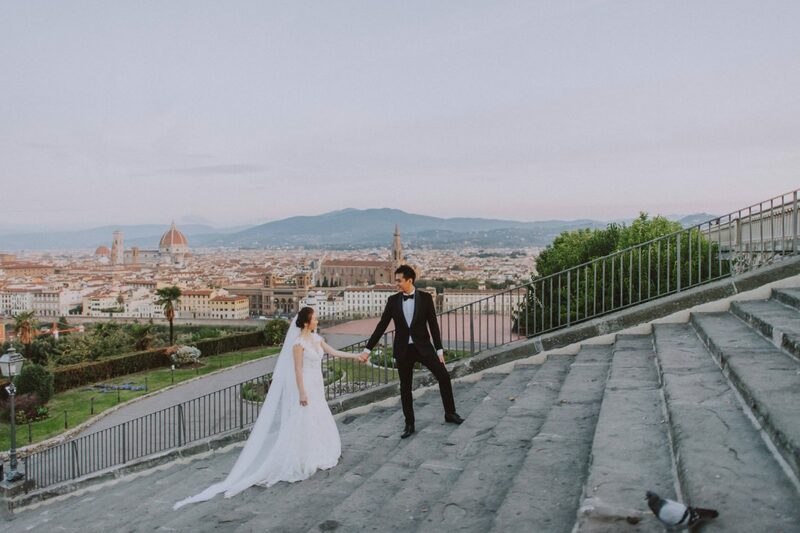 Enjoying the breathtaking view from Piazzale Michelangelo, the most significant spot with a view in Florence is absolutely inevitable for a photo shoot!What is (or for some of you was) your honeymoon destination? 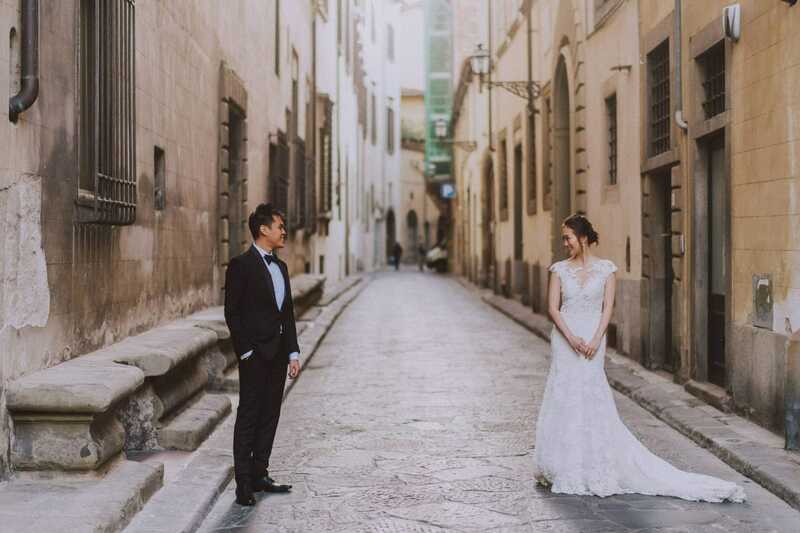 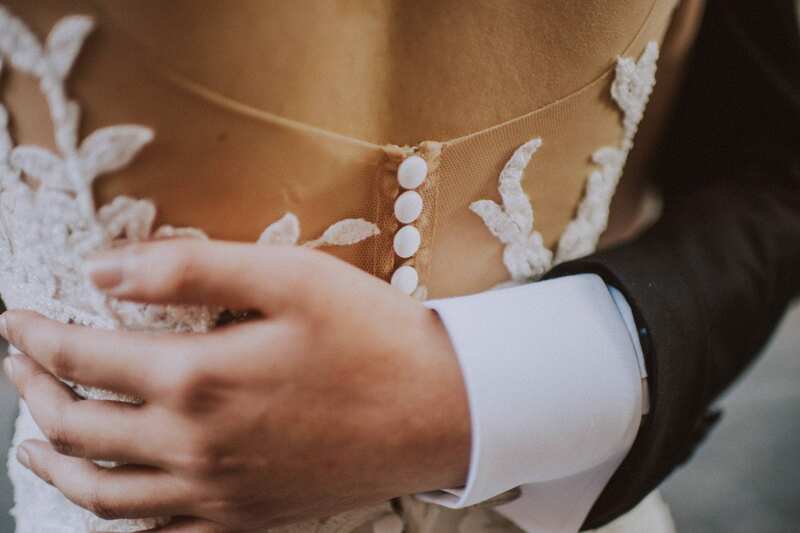 Do you consider to hire a photographer to immortalize your first trip as husband and wife? 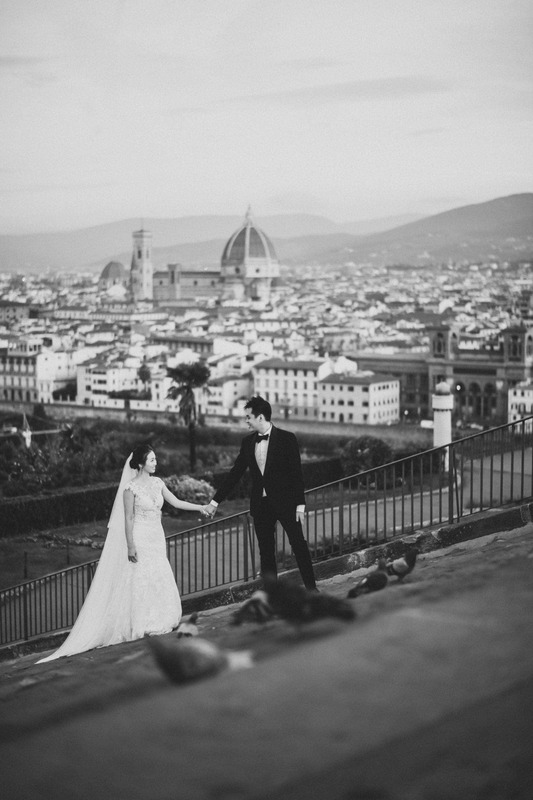 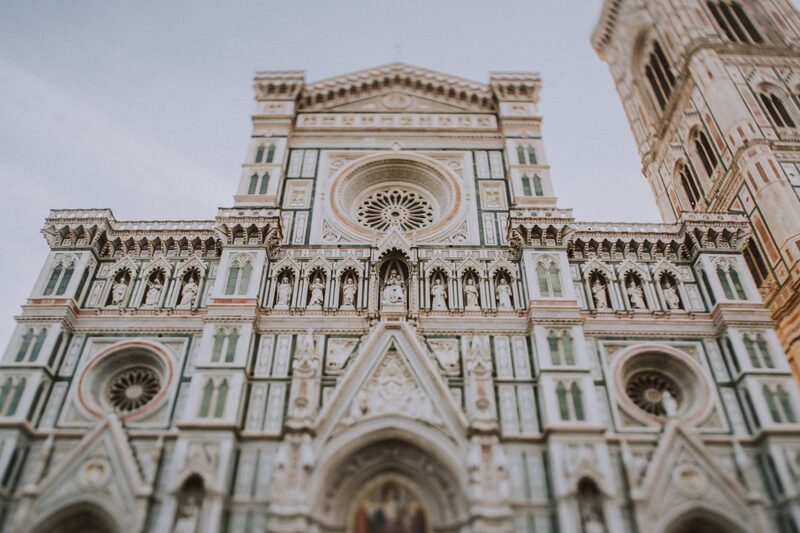 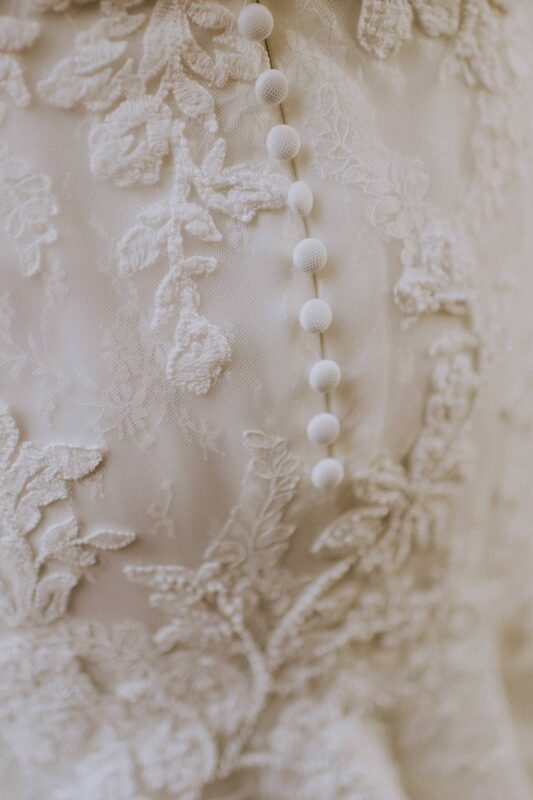 LOOKING FOR YOUR WEDDING, HONEYMOON, ELOPEMENT, PROPOSAL OR ENGAGEMENT PHOTOGRAPHER IN FLORENCE?